My husband, Willie Barbour of Lynchburg, Virginia needs a lifesaving kidney transplant. In 2009, on a work day like any other, he became very ill and was sent home. We were stunned when his doctor diagnosed him with cirrhosis of the liver. A few years later, in 2012, Willie was admitted to the University of Virginia Hospital (UVA) in Charlottesville for twenty-eight days! At that time, it became clear just how far the disease had progressed- tests showed kidney disease, diabetes, and high blood pressure. 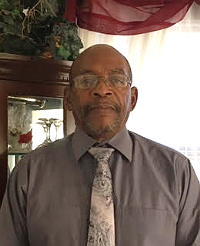 Hemodialysis was the next step so for the first year, Willie traveled three times a week to the UVA Dialysis Center in Lynchburg. For the last three years, he has done peritoneal dialysis meaning he does it at home but treatments are for a longer period. Willie is totally dependent on these dialysis treatments. His only chance to return to good health is a kidney transplant. Willie is a man who reflects his strong belief in God. For five years, he has been a faithful member of the Tree of Life Ministries in Lynchburg. Despite his illness, he continues to be a valuable member of the congregation serving as an usher/greeter. Willie has this special ability to make visitors of the church feel at home, setting the tone for people to enjoy worship service. God willing, a transplant will enable him to continue to serve for many years to come. Transplants are life-saving, but financially draining. Even with insurance, Willie is facing costly expenses that include travel to and from the center and a lump sum of up to $3000 (possibly more) for a six-month supply of post-transplant anti-rejection medication he will need to take for the rest of his life. He must have these funds before the hospital will make Willie active on the kidney transplant list. This is a challenge we cannot face alone. To help with the financial burden of Willie Barbour’s uninsured expenses, a fundraising campaign in his honor has been established with Help Hope Live, a trusted nonprofit organization that has been providing community-based fundraising guidance to patients and their families for more than 30 years. All donations are tax deductible to the full extent allowed by law, are held by Help Hope Live in the South-Atlantic Kidney Transplant Fund, and are administered by Help Hope Live for transplant-related expenses only. Please consider a contribution. Willie is being worked up for a kidney transplant and needs assistance to fund antiviral medications. Your donation is appreciated by him and his family.